The Android Pie update for the Galaxy S9 and Galaxy Note 9 may bring a new feature that was, er, introduced to Android three years ago. Yes, we’re talking about adoptable storage, which came to Android with Marshmallow back in 2015. 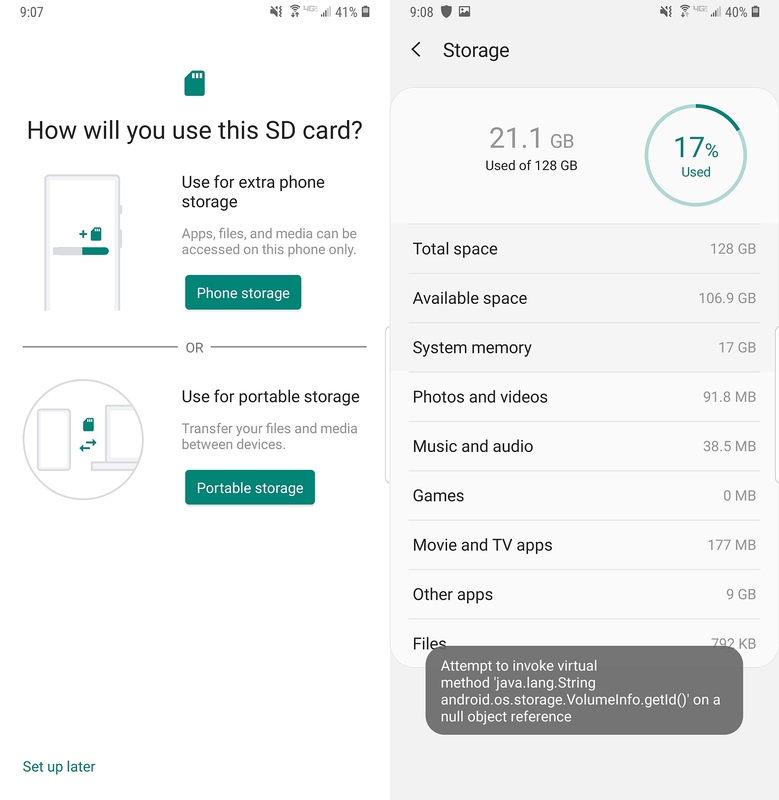 Adoptable storage allows a phone to treat the internal and external storage as one unified storage, and Samsung chose to exclude the feature on its devices, saying that adoptable storage is mostly just beneficial for budget phones. But it may finally come to Galaxy devices with Android Pie. The leaked Galaxy Note 9 Pie firmware has the option to format the microSD card and use it for extended phone storage. This was discovered by one of the members of the XDA Developers forums. It doesn’t work properly at the moment, but that should change on the final version of Pie (or on the beta versions that Samsung will release for the Galaxy S9 and S9+). Samsung may be too late with bringing adoptable storage to its devices, though. It was a necessary feature when Marshmallow came out because of the limited internal storage you would find on budget Galaxy devices back then, but Samsung is now offering at least 16GB of internal storage on most of its smartphones. And since none of the old devices with low internal storage are eligible for the Pie update, we wonder why the Korean giant is bringing adoptable storage support here in 2018. Not that we are complaining. Adoptable storage is still a useful feature that’s also a default part of the Android OS. Here’s hoping it’s functional on the first official Android Pie beta that Samsung will release for the Galaxy S9 and Galaxy S9+ later this month so we can test it out. With UHS-I interface compatible SD card readers? That is ridiculous! The SD card reader in my S9+ was not even able to reach the 104 MB/sec limit offered by the UHS-I interface. I measured 68 MB/sec R/W speeds with a premium SD card which was able to reach over 220 MB/sec read speed in a laptop which had the UHS-II interface (the one with the two rows of pins.) They should first change the outdated and slow card reader first before they even think about this option. and this feature would certainly help me with that. I wil not use it, if memory card suddenly corrupt? Linked in the text as well, cheers.